Discover the difference between a Cash Advance versus other financing options and why our cash advance program is the best option for your business needs. 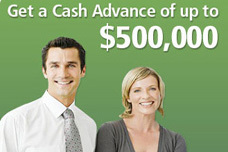 A cash advance is one of the easiest and most popular methods for small business financing. Small business owners know small business loans are hard to find these days. Banks decline as many as 92% of all busines loan applications due to bad credit or lack of collateral. Most business owners do not realize they have a hidden asset for receiving cash for their business. What is this hidden asset? The future Visa and MasterCard sales from your customers that can be purchased in advance. Unlike a bank loan or venture capital, a business cash advance has a 100% approval rate for qualified applicants. And with a small business cash advance, you only need to be in business for as little as 4 months to qualify. Ask us for more information on how your business can receive up to $500,000 in working capital against your future Visa/MasterCard sales in as little as 5 business days. If this is a realistic opportunity, it should be considered. Traditionally, this source of working capital is more expensive than bank financing, but does not usually carry the collateral or personal guarantee requirements. There are also significant “non-economic” considerations that need to be weighed carefully. Small Business Loans from Banks – Up to 92% Rejected? Small business lending is an analysis of risk and return on behalf of the bank. Studies show that up to 92% of small business bank loans are declined by banks. By requiring extensive documentation along with collateral coverage of 2:1 or greater and/or personal guarantees for the loan amount, the bank can significantly reduce your risk of loss and therefore the cost associated with making a bank loan. These requirements, which usually include 2-3 years of both business and personal tax returns as well as a business plan and “use of funds report” in addition to extensive and time-consuming loan applications, often prove frustrating for business owners. Because of these factors, traditional bank loan approvals are very difficult to obtain, but can be the least expensive form of business working capital and should be pursued if cost of capital is the most important consideration. Given the size of annual revenues and the amount of financing required to fund (business purpose), venture capital funding is not a reasonable option. Additionally, venture money will usually require some equity participation as well as some management influence. This loss of equity ownership and potential control will qualify this potential source of capital as undesirable and very expensive. Much like small business loans, getting approved for financing is very difficult. In order to get approved, most will require that business owners provide collateral (2:1 coverage) to cover the financing, be in business for at least 2 years, have excellent credit and borrow less than $100,000. Additional documentation requirements include a comprehensive business plan, audited personal/business tax returns for 2-3 years, detailed financial statements, personal guarantee regardless of legal entity and an application fee and closing costs. We will purchase a small percentage of your future credit card sales, until the payback is completed and give you the cash advance your business needs now! Our unsecured cash advance financing is the best alternative as compared to traditional banks and other financial sources. When the bank says no, we say YES! Get a custom quote from a specialist by filling out our ‘Apply Now’ form listed above, or you may continue reading to find out why our unsecured business cash advances is your best option.